NOS Chaussures Vélo NOEL 40 Vintage Cycling Shoes . État : Neuf Vendues avec leur boîte. TRACES USURE - WEAR AND TEAR Scroll / Faire défiler annonce. (US: 8/8.5 / UK: 7.5/8). Pointeur 39. Longueur extérieur : 25 cm. NEUVE EN BOITE. PLUSIEURS PAIRES EN BOITE. 39/40 Soubirac. Marke Soubirac. Biker Chaussures. ORIGINALE Chaussures. sans crampons. nouveau - utilisé. partie très rare - rareté absolue. Couleur: Noir avec Jaune. Country/Region of Manufacture China. Custom Bundle No. UPC Does not apply. These are new old stock Look Carbon Road Bike Shoes. They are a size 6us / 39eu. These show mild signs of wear from display and storage. Check pics for condition. Marke Soubirac. Biker Chaussures. ORIGINALE Chaussures. Schuhgröße EUR 40. - FABRIQUÉ EN FRANCE -. partie très rare - rareté absolue. Celles-ci ont été faites en France. Une partie de la colle est sur les côtés de la sangle. juste une surface mineure égratignures sur le dessus. La plante montre ainsi une usure minimale. Fond du sabot : env. Taille taille 34. Nouveau sujet < span class = « notranslate » > original, il peut y avoir des traces de poussière à cause de l’entreposage. I KNOW VERY LITTLE ABOUT THESE SHOES. I am unsure of the age. The upper seems to be fine, but has one or two tiny, tiny scuff marks. Take a good look at the photos for they speak louder then words. Errors happen, it is what you do about it that makes the difference. Besides, it is the right thing to do. 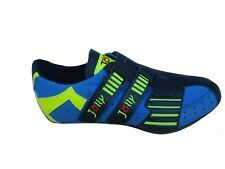 Shimano Mountain SPD shoes Size 42. brown, blue color. overall good condition. Money Back as soon as we received the item back. Size: 11.5. These were made in France. Approx US Wmn Sz9.5 (slightly wider width). They are also great for walking when your bike is parked, too. If not, a deduction/cleaning fee may apply. Size: (No size listed on shoes so based upon fit and the length of midsole ). 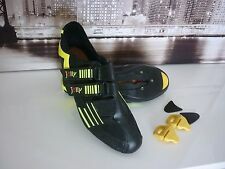 Clearing out shed, have this retro Look 347 triathlon shoes knocking around. In good condition only common marks of use. These are new Look Carbon Road Bike Shoes from 1986. They are a size 5. The box they are in is for a larger size shoe. These have some marks from storage and a few small blemishes. The laces under the straps have been chewed up a little by the laces. Check pics for condition.